From left, Barbara Housen, general counsel, and Carol Carson, executive director, of the Office of State Ethics. The Office of State Ethics is taking the rare step of seeking authority to subpoena personal financial information that Insurance Commissioner Katharine L. Wade has failed to provide the lawyer responsible for determining if Wade has a conflict of interest ruling on Anthem’s proposed acquisition of Cigna. The Citizens’ Ethics Advisory Board will be asked Thursday to formally begin a hearing process that allows state ethics attorneys to compel Wade and others to turn over documents in an effort to determine whether Wade and her husband would profit from Wade’s approval of the deal combining the nation’s second- and four-largest health insurers. In correspondence made public Monday, the Office of State Ethics’ general counsel, Barbara Housen, tells Wade’s personal attorney, Kimberly A. Knox, that a declaratory ruling sought by Common Cause on the question of whether Wade has a conflict cannot be completed due to the commissioner’s failure to provide requested documents. But Wade’s lawyer says in correspondence that Wade has been responsive and the issue, at least for the moment, is moot: Until an anti-trust lawsuit filed by U.S. Department of Justice to stop the Anthem-Cigna deal is resolved, the state Insurance Department has suspended its review. An agenda posted for Thursday’s monthly meeting indicates that Housen is asking the board to take two actions: provide more time to prepare a recommended declaratory ruling; and to open a formal hearing process to compel Wade to answer Housen’s questions. The latter request represents an extraordinary escalation in efforts by the Office of State Ethics to determine if Wade has a conflict stemming from her past employment by the Bloomfield-based Cigna, where her husband still works. “I’ve been here almost nine years, and we’ve never done this before,” said Carol Carson, executive director of the Office of State Ethics. In an update to the board about pending legal opinions, Housen says the Wade case is the first time in her 10 years with the office that she has failed to obtain necessary facts to recommend a ruling. “In fact, it has become increasingly clear to me that a more in-depth and extensive information gathering needs to be conducted,” Housen told the board in writing. A spokeswoman for the Insurance Department said Wade has been providing the Office of State Ethics with information for more than a month and intends to provide Housen with additional requested information. “Commissioner Wade is complying with the Office of State Ethics and is sending responses to the OSE’s latest questions by day’s end,” said Donna Tommelleo, the department communication director. But the commissioner’s lawyer, Knox, also objected to the scope of the documents sought in a letter to Housen. “The request impermissibly seeks information not· required under the Code of Ethics financial filing disclosure requirements. General Statutes § 1-83. It is seeking, in a public forum, granular information about Mr. Wade’s personal employment compensation,” Knox wrote. Knox also said that neither Wade or her husband currently owns Cigna stock, while Michael Wade can expect stock as part of deferred compensation contingent on his continued employment, as do other Cigna employees..
“Mr. Wade’s unvested stock and options will next vest in approximately the last week of February/first week of March 2017, 2018, and 2019,” Knox wrote. “It is speculative to assume that he will own stock or options in the future as such compensation is tied to his continued employment. Until such time as the unvested stock and options vest, there is no legal basis upon which to determine any conflict of interest,” she wrote. The office of Gov. Dannel P. Malloy had no comment on Housen’s requests. “I can’t believe Gov. 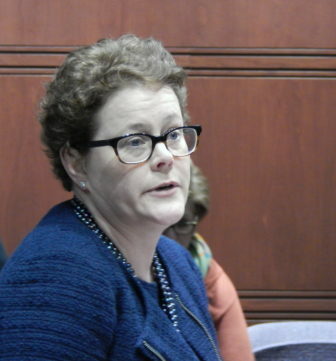 Malloy is allowing the commissioner to stonewall the ethics commission,” said Tom Swan, the executive director of the Connecticut Citizen Action Group, which has asked Wade to recuse herself from ruling on the merger. 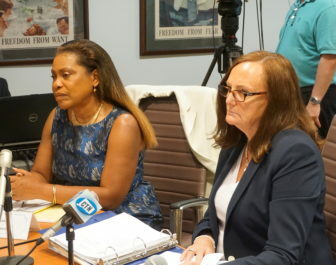 The Citizens’ Ethics Advisory Board voted unanimously in June to grant a petition by Common Cause, one of the advocacy groups that have questioned the impact of the merger on consumers and the propriety of Wade’s role, to review her status and issue a binding declaratory ruling on whether she must recuse herself. Wade was employed by Cigna from 1992 to 2013, rising to vice president of government affairs, the company’s chief lobbyist. Her husband, Michael T. Wade, still works there as associate chief counsel for litigation. She says she holds no shares of Cigna stock, having divested it in April 2014. “The potential nominee will recuse themselves on any matter involving the former employer with which the nominee had active involvement during employment, which ended in December 2013. “The potential nominee and spouse will put any industry-related assets, including any stock in the spouse’s employer, into a blind trust with an independent fiduciary who would have sole and exclusive authority to make transactions. “The spouse’s employer will formally firewall/recuse the spouse from any information related to the company’s dealings with the Department. The action would be memorialized in a writing similar to that used by financial services firms to firewall individuals with material inside information from other employees. Housen says in a letter to Knox that she has twice asked Wade to tell her the number of Cigna shares her spouse stands to gain each year under a vesting schedule she previously disclosed. Knox’s position is that Wade already has disclosed the information. She also is asking for information to clarify what actions Wade has taken on the merger application, a $54 billion deal in which Anthem would control the combined company. Industry analysts are speculating the deal never will be completed, due to anti-trust concerns raised by the U.S. Department of Justice and opposition by some insurance commissioners. The Justice Department filed suit in June seeking block two mega-mergers involving Connecticut health insurers, Anthem-Cigna and Hartford-based Aetna’s plan to buy Humana. The two deals would reduce the number of major health insurers to three. Wade is considered a lead regulator in the Anthem-Cigna deal. Her staff is reviewing Anthem’s voluminous application. Once the application is deemed complete, it will be up to Wade to call a public hearing and then reject or approve the application, with or without conditions. A prescriptive state law tilts toward approval.